These are wrapped box with heavy Mauve-colored paper, and gift-tagged on the outside and inside with "A Gift of Good Taste". Just type in your gift message that you want included, and we will hand-write it in green ink for you on a tasteful mini-card to your friends and relatives. Note: If you do not include a gift message, we will ship it more simply in a white box gift-tagged on the top side "A Gift of Good Taste". Choose any combination of flavors that you want. The 5-bottle case is the most economical order quantity. ($4.99 per 2 Ounce Bottle). Unlike extracts, we minimize the alcohol to a very nominal level --of less than 1/30th of a teaspoon per serving. This is equivalent to about 150 cups of coffee with these flavors, to about 1 glass of wine, and less than the naturally occurring amount in naturally squeezed ripe orange juice. 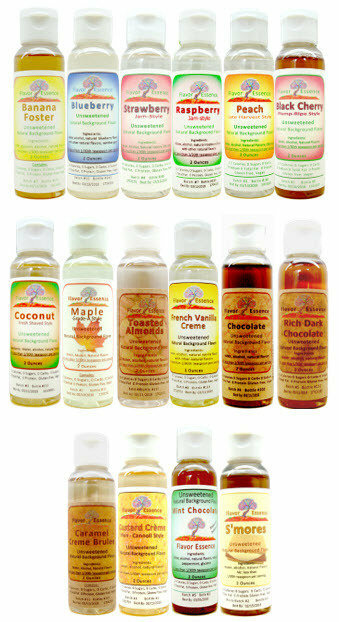 Gourmet quality -no allergens, vegan friendly, diabetic friendly, athlete friendly. Its a fun & tasty background flavoring; but its still no nonsense--> "the flavor and just the flavor". You can flavor anything your own way, and flavor it to your own desired levels of strength. 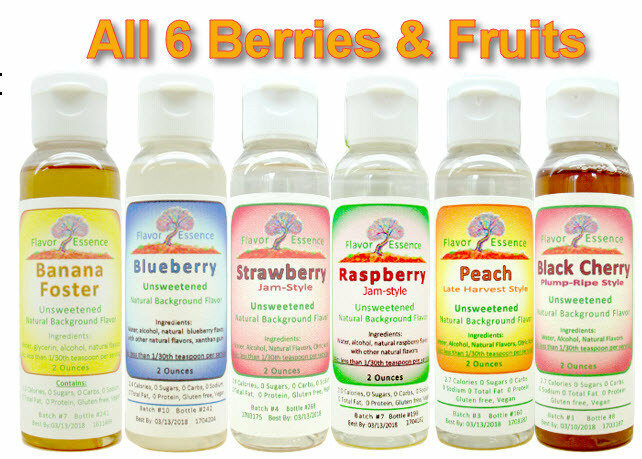 Flavor Essence Has No Sweeteners: (Add your own favorite if your tastes or recipes call for it). There are also no added colors or preservatives, no calories, carbs, fat, sodium or gluten. And believe it or not these still smell and taste great. They are concentrated to act as "Background Flavors". 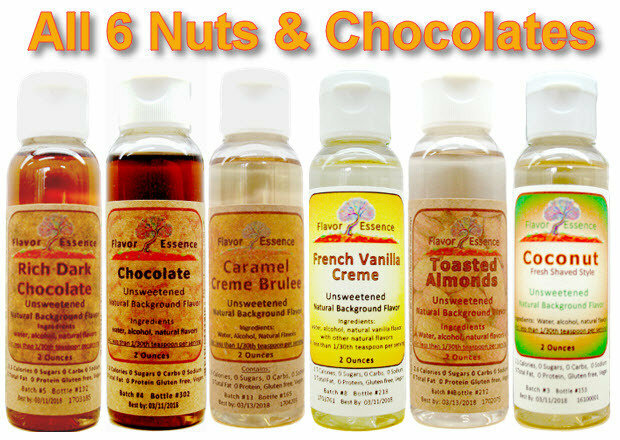 Unlike extracts and syrups that can quickly overpower your recipe, Flavor Essence is gourmet-quality flavor styled to play a well-behaved supportive role, that complements and adds complex taste -- that doesn't dominate over the primary flavors of your favorite beverages and food recipes. *** In Beverages *** great in coffees, teas, seltzers, protein shakes, smoothies and bar-drinks. 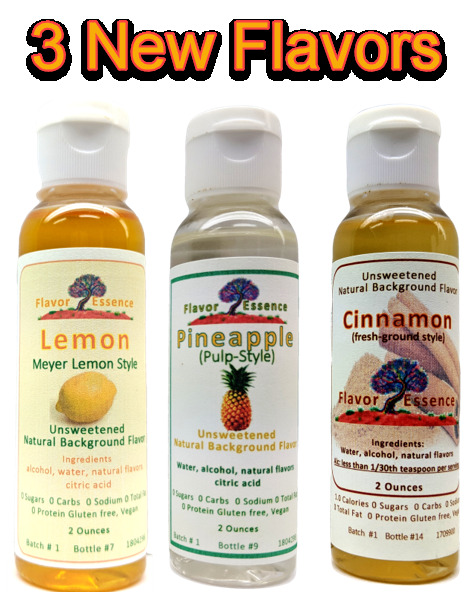 "Flavor to taste", using from a couple of drops large drinks --up 1 to 2 generous squeezes of Flavor Essence and stir into 12 ounce drinks. (Get to know your flavor by starting off with a small amount—then add more to match your own taste pleasures. For Soda Stream or seltzer /sparkling, 2-3 squeezes will improve the flavor of a liter -- adjust to your own taste levels. In vodka, rum, tequila --a lesser amount is used in straight-up drinks on the rocks. Add your favorite sweetener –since sweeteners tend to amplify the flavoring, adjust to your tastes. Also, the underlying sugars in juices will amplify the flavor –so again customize your flavor-levels to your own desired tastes. Add into almost any baking/cooking project without altering your primary recipes, batters, doughs, mixes, whips, frostings and yogurts. You can even flavor your honey & maple syrup directly. In baking, the cocoon-effect of doughs and batters will serve to protect and permeate the added flavors. But in high heat cooking, like custards and oatmeal always add a bit of background flavor at the end, **after the heat is turned down –not at the beginning**. Soft, very ripened-banana with complex aroma & taste nuances of buttery brown sugar and a touch of rum/vanilla without any type of sweetener. In this special flavor recipe, we’ve finally pulled together the friendly, sweet, soft, ripe, perfumes and flavors you experience when a banana goes past the "green stage" and its skin peels off so easily and tastes so plump and fruit-laden. (The owner is a banana lover, and this recipe went through the most work, re-work and tweaking until the aromas and taste could only be beaten by aging and peeling a banana). Lively / clean aromas and flavor of true-to-form blueberry -- showing off ripe fresh blueberry flavor only. The berry, in its perfume and flavor, has a dainty but ripened personality. It is our best effort to giving you "the right blueberry flavor", nothing else. Beyond its use in hot/iced coffees & teas, this does very well in smoothies as well as high-end vodka martinis. After a year of trials, taste testings and revisions, we finally have a true-to-form natural dark cherry that has plump-ripe perfumes and soft/chubby cherry flavors. As one of the most-recently added flavorings, it might have proven to be the toughest of them all "to get it right". The goal was to give you something more real than ever, and to let you forget about syrups and candies. It's about tasting the fruit you see once a year on the tree or in a good jar of preserves! Perfumes of fresh-shaved coconut, and ripe-clean tasting, almost “meaty coconut” flavor. As opposed to being sweet, creamy or oily, our style of Coconut focusses on just the simple tropically fresh coconut meat as its primary personality trait, and then a second characteristic that gives you a piece of soft nuttiness in the finish. [To get gourmet level unsweetened Coconut into drinks is otherwise almost impossible and in food/baking this Coconut will prove to be very practical. This Coconut might end up being one of the most versatile of all flavors –you can easily blend this into our other flavors, or “as-is” into a very large range of drinks and enhance your creative baking projects. Ripened raspberry with darker aromas & tastes of warm jam –it has the kind of perfumes and flavor of the berries when they are about to fall from the vine. Compared to the pre-flavored raspberry that you've had before, this does not have that "ribbon candy" or “sweety-pie character” that artificial raspberry flavoring often exhibits. Nice bouncy strawberry perfumes with the juicy taste of jammy strawberry. Its “boisterous” personality ought to remind you of real, vine-softened, strawberries that stain your fingers from a local Pick-Your-Own farm (--not the store-bought strawberries that are huge, look nice, but are shelf-ripened and almost tasteless). This tasty Strawberry even has a small hint of some fresh earthiness from the little seeds. Fresh nutty and sweet aromas of almonds --without any sugars, and slow- roasted almond in its soft body of flavor. This flavor reveals some great almond nut-laden layers of taste in the middle ,and a soft lingering finish. What's nice here is that it is a bit more forward than some of the other Flavor Essence flavorings, but it still has a clean daintiness with no odd aftertastes. The flavor is nicely amplified when you add your own sweeteners that you desire. Noticeable aromas of a warm deep chocolate bar. Unlike dark cocoa or chocolate, this has the pleasantly deeper darker melted chocolate flavor without any bitterness. (Also for sensitive folks, like the other flavors this contains no sugars & does not have allergens). This dark chocolate plays well when blended with the Toasted Almonds and Banana Foster. This Rich Dark Chocolate is the perfect background flavoring when you want to add a clean-tasting darker chocolate background dimension to your beverages and your creative food recipes. 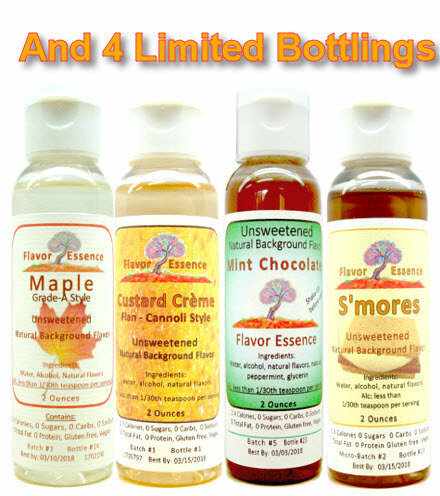 Melted caramel and sweet cream custard aromas and flavors without any sugars (add your own). This is a dainty but seductively rich set of flavors. It can nicely add complexity and pleasing background flavors to any coffee, oatmeal, chocolate chip recipe, muffin mix (and even exotic adult beverages/ drinks that contain Baileys, Kahlua or amaretto). The Caramel Crème Brulee natural concentrate is kind of a secret item --because it is not an off-the-shelf flavor that is either simple to mimic or commonly found as an ingredient. Creative people, chefs and bartenders will find and get new pleasures from this “secret ingredient”. Very clean fresh vanilla with a sweet aroma and soft texture that brings about a creamy custard backdrop onto your palette. This is different than ordinary vanilla because of its dainty perfumes and flavors that will accent your coffees/teas with some finesse. (Another positive side-effect, is that this flavor and all of the others will smooth off the bight or acidity of coffees/teas and alcohol-based drinks. In all applications, this will provide a soft rich background flavor). In cookie mixes, French toast batters, bread doughs and cake mixes, the French Vanilla Creme differs from extracts in that it is a more mellow and integrated component that enriches the primary flavors as a subtle backdrop to your recipe. Sweet creamy perfumes, rich-soft flavors of warm Flan and fresh Cannoli filling. It has a complex set of perfumes of freshly beaten brown sugar, vanilla bean, eggs and rich cream. Custard Crème shows off layers of taste that are kind of like that spoonful of cookie dough or cannoli filling that you sniff and steal from the bowl when baking. This is our first flavor that almost deserves the term "voluptuous". Even while this creamy flavor belongs in the same "family" as a good vanilla, this actually picks up where simple vanilla ends—adding a richness and complexity not tasted before in mere vanilla. Rich earthy aromas, with very warm-clean maple body of flavor. The overall finish of this Maple is lush, yet elegantly soft. (This recipe is completely without any sweeteners --add your own). And it is a kind of exciting product for you to use, without that cloying artificial candy-ish taste or after-taste that is so disappointing in artificial products. If you've ever visited a sugar shack in New England while Maple sap is being boiled and evaporated, the aromas/perfume of this Maple will remind you of the heady steam that fills the sugar shack on the 1st evaporation runs. This unique product has a flavor "personality" that deliciously tastes like the Grade-A samplings that visitors get to sip while the first vats of concentrated maple liquid are still warm. Fragrantly minty with light but creamy nuances of melted chocolate. This limited-edition flavor is unsweetened -as are all of the flavors, and is nicely laced with clean natural peppermint, a blend of chocolate and rich dark chocolate so that it can hit both the high notes and low notes in taste. The mint is robust enough to show itself off above the chocolate aromas and also linger in a lightly cooling finish. This flavoring will “amplify” very well when you add your own sweeteners, or even better when you “borrow” off of the existing sugars in your shakes, hot chocolate, Baileys, ice creams or cookie doughs. This is a fun but complex taste experiment with a tri-level blend of lean milk chocolate, marshmallow and graham cracker. As with the real thing taken from the fire, some folks prefer lightly toasted marshmallow --not burned or scorched. Deliciously sweet and almost heady aromas of fresh cinnamon, vanilla bean, a touch of fresh allspice, just a smidge of nutmeg and less than a smattering of clove. This is the very classic Old New England blend of spices, all coming together; to show off both earthiness and freshness --you know, the kind you dream of in a suave café latte, in refreshing herbal teas, and in home-made pies, and warm spiced muffins, and of course hot spiced ciders. The "finish" of this Pumpkin Spice is soft and elegant, with lingering almost seductive perfumes.